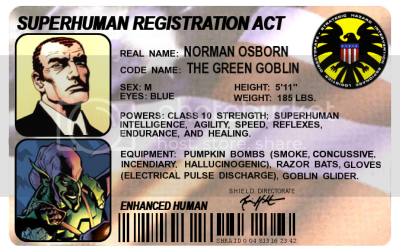 Name: Norman Amberson Osborn II, "The Green Goblin." Features: Blue eyes. Weirdly wavy/curly red-brown hair. Heavy scarring all over his body, including a nearly foot-wide cross-shaped scar on his chest. Dress: Usually wears expensive tailored business suits, or black slacks and a silk button-up shirt (similarly high quality). Preferred colours are black, green, purple, and occasionally blue and brown. Accessories: PDA. Cell phone/PINpoint. Backup PINpoint, 'stopwatch' style. T-Watch. Silver cigarette case, godsforged (contains 10 Sobranie Black Russian cigarettes, tapping cigarettes on the side of the case will light them). 7-3/8" Italian switchblade, dark horn handle (blade 3-3/8"). Black leather wallet containing several high-limit credit cards, around $1000 in 2007 US dollars, several ID cards (including his SHRA ID card, pictured here), and a small plastic card containing information and instructions in case he ever develops amnesia again. A bright boy (with a fondness for comic books and science fiction) Norman was able to attend college at Empire State University despite his father's hemorrhaging of the family fortune. He majored in some kind of science, probably chemistry. After his father's death, he took over the company and set out to haul it out of the hole his father had driven it into. He was very, very successful. Either at college or soon afterward, he met Emily, a young woman who he fell in love with and married. She was a stabilising influence on his life, and he was devastated when she died due to complications during the birth of their child, Harry. He was never really the same, after that — and though he did raise Harry as best he could, he was generally neglectful of his son, and disappointed in his lack of drive. 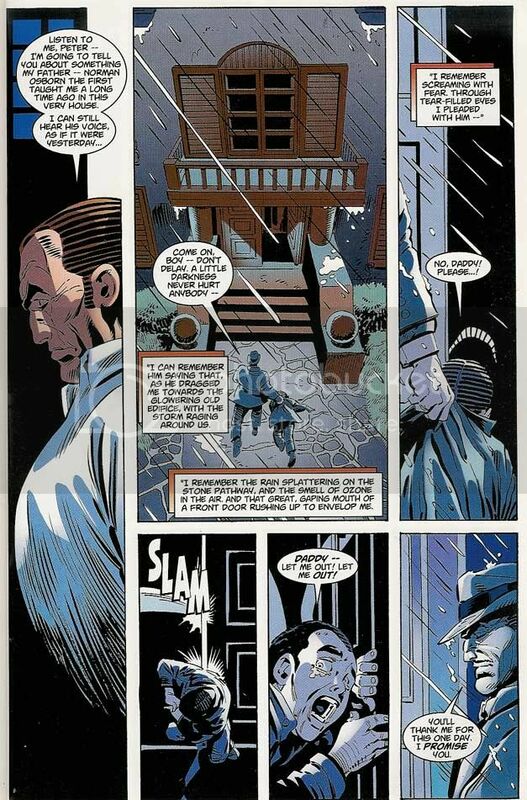 Norman's acquisition of his powers, and his deeds thereafter, are outlined adequately here — the Nexus version does not diverge from this until the aftermath of the fight with Dr. Octopus on the Queensboro bridge, whereupon Norman found the Nexus, first via the Sages of Chaos online site, and then in person. He was quick to realise the opportunities that the Nexus presented him, and though his first weeks there were rather rocky (his world's Spider-Man had been there for a while before him, and his friends were quick to rush to his defense), he soon began to make allies — among them a god from a fading world, called Hermes. Hermes, god of thieves to liars, got on well with the supervillain, and saw in him a way to escape from his faithless world. They soon began a relationship. Of course, close association with gods rarely leaves a mortal unscathed. Norman soon discovered a slight proficency with manipulating probabilities, one he was (understandably) interested in refining. He became able to force coin-tosses and dice rolls to go a particular way. Eventually his world's Spider-man found out about this, and challenged him to roll an eight on a six-sided die. A seven on such a thing is fairly easy (just instrument an event that causes the die to be split in half), but an eight is something else entirely, and Norman was excited by the concept. After weeks of effort (and ignoring the warnings and prophecies of doom of nearly everyone), Osborn attempted to do just that. And proceeded to nearly unravel the fabric of the multiverse. Caught at the epicentre of the event, he was affected heavily — losing not only his ability to sense and manipulate probabilities, but also his physical sight. This was a terrifying experience for him, and upon learning that there was no way to cure his blindness through conventional means, he began to ook toward other solutions. It was at this point that he made the acquaintance of the Outer God Nyarlathotep (wiki), and made a fateful bargain with him — his sight restored, in exchange for Norman's services as priest and promoter of one of the god's dark cults. Norman embarked upon this new job with a terrifying enthusiasm, quickly converting his personal cult, ‘The Order of the Goblin,’ and establishing others on various worlds. He began to learn more about the world in which he was now embroiled, devouring the Necronomicon, Cultes des Goules, and other foul texts voraciously. (Already insane, he suffered very little from the new knowledge.) Hermes and others attempted to extricate him from Nyarlathotep's grasp more than once, but Norman was unwilling to be saved — it might end with his damnation, but he was content with this life. …unless he could have one as something more powerful. When Nyarlathotep gave him the gift of a single wish, Norman used it to become the resident spirit (or lare) of a small portion of the Nexus, a laboratory complex known as the Nexus Labs. This granted him godlike powers and characteristics, including the need for worship and offerings to sustain himself. He became especially fond of human sacrifices, something Spider-Man (with whom Norman had forged a sort of truce, on the understanding that he would behave himself) was horrified to discover. The situation couldn't stand, of course — something had to be done, and Norman had to be stopped. 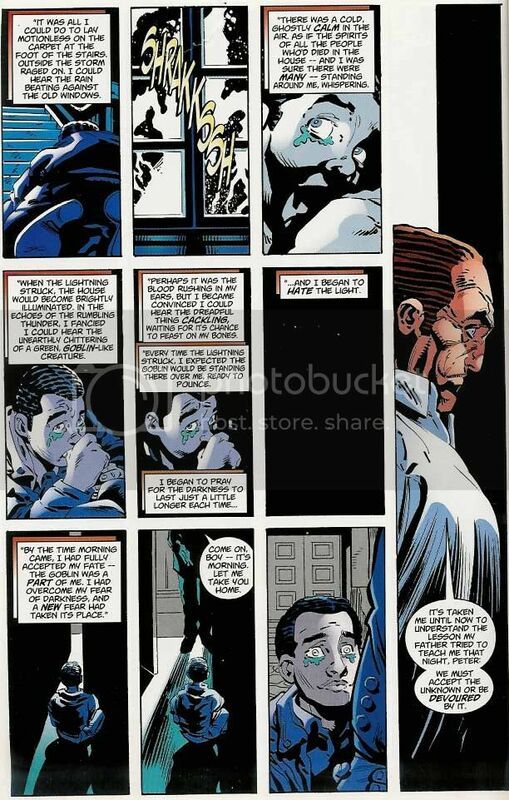 Putting his months of study of the fundamental nature of the Nexus to good use, Spider-Man invented a device that could bind or strip a god's power, which he connected toa dagger given to him by his lover Namor, the Sub-Mariner — creating a weapon he intended to use only to contain Norman until something more reasonable could be worked out. But Parker luck reared its ugly head once more — due to Hermes's interference, and a short in the device, the day ended with Hermes rendered mortal (and dying, due to unrelated reasons), and Norman's mind trapped in the building he had claimed as his own. Norman was eventually restored to a human body, but he was seriously traumatised by the ordeal, and the loss of the power he'd grown so used to. There was a temporary regaining of the abilities, due to a suicide attempt that managed to restore his connection to the building — but this was soon revoked, and the status quo restored. Mortal again, and only barely more than human. Thus reduced, and out of touch with the situation on his home world (he'd taken steps, previously, to break ties with that universe entirely), Norman stumbled back into Marvel canon. Picked up outside of Paris by SHIELD agents, he was offered a deal — work with them, in exchange for a commuted sentence. Not really needing this — at this point, really, a simple invocation of Hermes would have been all it would have taken to escape — but curious to see where things would go, he agreed. It was a mistake of a magnitude he couldn't have imagined. The nanites they injected him with chained him again to his homeworld, to SHIELD and the American government. After a short period in the lower levels of Stark Tower, and an even shorter period as a faux 'rogue agent,' once the "Civil War" itself was over Norman was finally given a semi-permanent position — Director of the re-re-re-reformed Thunderbolts, in charge of keeping the discordant team together and sending them after unregistered heroes. Norman is not a good person. Even before his exposure to the Goblin formula and his spiral into costumed villainy, he was manipulative and amoral, only barely avoiding true sociopathy. He twists and omits the truth as it suits him, and is equally accomplished at bald lies. He has very few problems with the idea of murder for profit, for revenge, or just for fun. Connections with other people are rare, and he tends to treat them as possessions or pawns instead of thinking beings. "Mine" is an endearment, in his mind. He suffers, as well, from severe bipolar disorder (partially mitigated by psychiatric medications), and is prone to violent mood swings and and destructive tantrums, as well as fits of hysteria. Occasionally, he experiences difficulty with auditory or visual hallucinations as well, but these are rare. Norman is a Superhuman Class 10, able to overhead press roughly nine tons. His agility, speed, reflexes and endurance are all superhuman on a level that lend him the ability to to toe to toe with Spider-man (if not win), as are his intelligence and healing rate. Purple leather gloves that shoot ‘sparks’ — white-hot iron filings — and that are capable of conducting pulses of electricity upwards of 10,000 volts. The gloves also have a number of electronic controls embedded in the lining, giving Norman the ability to control his glider and call it from a distance. Sharp-edged throwing knives shaped like bats. Gas and chemicals able to numb Spider-Man's spider-sense. His goblin glider, powered by a miniature turbo-fan and able to go up to 90 miles per hour and support 400 pounds. Norman's scientific accomplishments are many, in fields ranging from genetics to robotics and weapons engineering, and especially biochemistry. However, while he is brilliant on a theoretical level, he is notoriously poor with the more practical details, especially concerning safety procedures. The accident that gave him his powers was not the first time he'd screwed up in the lab, suffice it to say. He also has as few scruples on this level as he does elsewhere — human experimentation and research theft are things he sees as being perfectly acceptable, as long as one doesn't get caught. 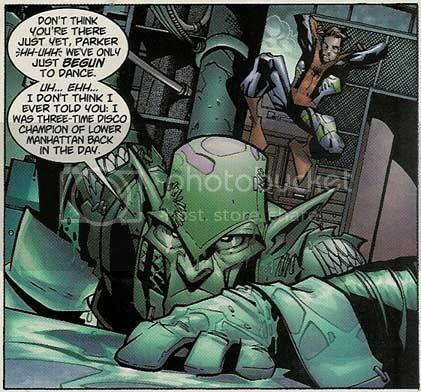 In the Nexus, he has developed vaccines and cures for the Clench and Captain Trips, as well as creating a version of his Goblin Formula stripped of all effects but the healing factor. He also has developed a number of blood flavourings for vampires and the like, which may be given to a living being intravenously. So far, these come in vanilla, banana, strawberry, cherry, and chocolate. Not only working as a worshiper/student of Nyarlathotep for several months, but also given powers by the Outer God that bound him to the Nexus Labs as the household god (or lare) of the building, Norman has a depth of knowledge on eldritch matters that few human mortals can match. He keeps an extensive, heavily-warded collection of powerful books and artifacts in his home. However, due to Amber Osborn's interference, he is completely mortal and unable to make any use of the information he has for personal gain or empowerment. He simply cannot bring himself to become interested in the idea, no matter how unusual he knows this is. Norman exhibits side effects from his psychiatric medications, which include Lithane (lithium carbonate) and Tegretol (carbamazepine). Those two combined can have neurotoxic side effects, which manifest in Norman as mild tremors which intensify when he is upset. These may be mitigated by a supplemental dose of Goblin Formula, at the loss of some degree of the medication's effectiveness. As a condition of his arrangement with S.H.I.E.L.D. to retain some degree of freedom, Norman is host to a collection of nanites that monitor his mental and emotional state and subject him to certain behavior restrictions. If he becomes enraged, or attempts to attack another person, he is subjected to a strong electric shock. This is intensely painful, and typically sends him into seizures and causes foaming at the mouth. The effects last for one to five minutes, depending on the intensity of the shock. If he attempts to enlighten others to the existence of the nanites, or exactly what they can do/have done, he finds himself unable to speak, feeling nauseated and developing an intense headache. A past version of the nanites was altered by Tony Stark (in a bid to cause tension between Atlantis and the United States, and possibly unite heroes under the threat of war with the aquatic nation) to take Norman 'off the radar' — ostensibly rogue, but still monitorable by Stark. It is implied that these altered nanites lent some higher level of control over Norman, either giving Stark the ability to subdue him after the attack on the Atlantean nationals, or just to have been controlling him throughout the whole attack (the more likely option). These have been replaced, and that 'feature' presumably invalidated. For now.